Even though I have my essential on-the-go files on DropBox and have access to it all the time no matter where I am, there are times I need to get to my home computer when I am away. Also, this is a great way to remote control and help a friend/family computer. I have tried many other remote access software but one that has stuck with me for months is the LogMeIn free version. LogMeIn stands out from the rest as it doesn’t need a remote access client to access your computer running LogMeIn software. It just runs straight out of a browser. And you don’t have to lift a finger to configure your firewall or proxy configuration to access it either. It just works. Reboot and reconnect. You can even restart in safe mode. LogMeIn Free comes with a great set of features that should fit perfectly for a home user. LogMeIn is running a special right now where they are offering 5 PC support for $19.95/month. LogMeIn stands out from the rest of the alternatives by offering an awesome iPhone app – LogMeIn Ignition. You can totally remote control your desktop from anywhere right from your iPhone. Think of the possibilities this opens up for you. If you are keeping up with the tech, you might already have some of these installed in your computer. Tim at Daily Cup of Tech how you can roll your own LogMeIn Pro with some free software available. to get File Sharing, Remote Printing and Desktop Sharing features available in the Pro version. LogMeIn is an excellent remote access software and I highly recommend it. I have tried the VNC option before and still use it on some Linux machines but the simplicity of accessing your computer via a browser could make a huge selling point for you. Stay tuned for the announcement of a huge contest/giveaway here in ShanKrila. I thnk the easiest remote access tool out there is Techinline (http://www.techinline.com) It’s probably the easiest connection process available, and requires absolutely no installations or downloads (fully browser based). I’ve been using it for a while and before had an account with GoToAssist. Just windows or for Os x also? BurnThats last blog post..Burn Fat: How To Accelerate Fat Burn Easily! Best Remote Access For Your Computer – LogMeIn Free | ShanKri-la great article thank you. Great tip. I’ve been using ShowMyPC to support relative and was quite happy with that. But I didn’t have a good solution to access my own home PC. I’m just a bit worried that this might leave the door open for a relatively easy entry by someone who’s trying to hack it. I’m not a security specialist, so i”m going to read a bit more about that part before setting it up. 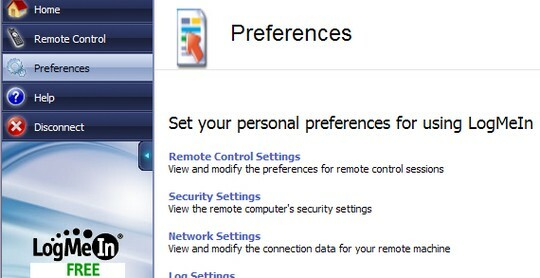 .-= Luc J´s last blog ..ShowMyPC – Free Remote PC Support For Your Relatives =-. I actually really appreciated the support and interface of LogMeIn’s remote access software but I have since started using another service, Proxy Networks. I know you can try many versions of remote software, like TechInLine, LogMeIn, Hamanchi and Proxy Networks, for free. Many even have free versions. I like Proxy because of the security layers and the interface. It also doesn’t weigh heavy on my laptop and the installation was a snap. But like I said- I would play around and try a few before committing to one. LogMeIn is cool but the price is too high. Radmin is cheap and works brill. I appreciated this software several years ago for first of all for its speed and stable work. I still like it more than other products. This is the first remote desktop application that i came to know.It looked like a miracle to me when i saw it first.I was able to access my home computer from office, i even never thought about such a thing.Everything is possible with in the world of internet. A buddy of mine swears by LogMeIn’s Ignition app. I’m tempted to wonder if his high opinion of it is not due to cognitive dissonance in some way. I’m no stranger to paying for software, as I use proxy networks <a href="http://www.proxynetworks.com">http://www.proxynetworks.com</a> for by business remote access, but nearly $30 for an app seems steep. Thanks for the information on LogMeIn. It can be difficult to select the remote control software that suits to you best. To see a comparison of many of the programs available today, both for free and at a low cost, check out: http://en.wikipedia.org/wiki/Comparison_of_remote_desktop_software. Thanks for the information on LogMeIn. It can be difficult to select the u00a0remote control software that suits to you best. To see a comparison of many of the programs available today, both for free and at a low cost, check out: http://en.wikipedia.org/wiki/Comparison_of_remote_desktop_software.